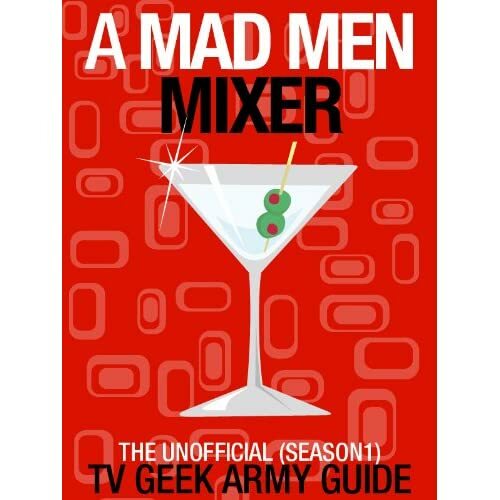 Posted on Saturday, July 23, 2011, by Eric - TV Geek Army "Revered Leader"
Nearly halfway into Mad Men’s first season, we know the main players pretty well by now. “Babylon” delves into their desires for what they wish the world to be and how they rearrange their lives and suffer the consequences in trying to make it so. Don and Betty act out their roles in a stage play called Ideal Household and Family while Don and Midge meanwhile star in the off-Broadway play, Company Man and His Greenwich Village Mistress. Roger and Joan know that what they have won’t last – she’ll find someone “more suitable” while he’ll move onto the “’61 model.” And Peggy expresses the desire of all women to not be one lipstick in a box of 100, unknowingly kick starting her rise up the ranks in the advertising industry. A key moment comes when Rachel Menken reluctantly agrees to meet with Don for lunch to discuss “urgent business.” Don is interested to get her insight on Jews and Israel that “doesn’t come from the Ministry of Propaganda” in the hope of landing the Israeli Tourism Board account, but of course he’s also looking for any in with her. Rachel doesn’t feel comfortable representing herself as an expert on such matters (she’s a not particularly religious New Yorker, not an Israeli) and we can tell that she feels torn overall about her feelings and the potential to get sucked into the force field of Don Draper’s charm. This double-meaning symbolizes much of what is going on in “Babylon” and in Mad Men as a whole. In the most immediate sense, it represents Rachel’s desire to be with Don but her belief that it could never work (of course, she soon gives in to her desire only to be spectacularly disappointed shortly thereafter). For Don it represents the utopia that he invents for himself, one that he initially conjured out of the tragedy of the “real” Don Draper’s death in Korea. As Don told Rachel in the pilot episode, “I’m living like there’s no tomorrow, because there isn’t any.” Don has willed an artificial reality into being and must spend time, money, and emotional effort to maintain it in the hope that the past will never tap him on the shoulder. And in a global sense I believe it relates a little bit to the decade that lies before these characters. The 1960s, as we currently hold the decade in our collective imagination, was a time of great hope, great chaos, and nearly revolutionary fervor. It was a time in which many strove for a good place that could never be.